Subir Sachdev, William Witczak-Krempa, and Erik Sørensen are condensed matter physicists. They study exotic but tangible systems, such as superfluids. And their latest paper about one such system has a black hole in it. How did a black hole get into a condensed matter paper? "Well, it's a long story," says Sachdev, who is a professor at Harvard and a Distinguished Visiting Research Chair at Perimeter Institute. It's a long story, he might add, that in a way starts with him: he was one of the first condensed matter physicists to venture into the strange land of string theory, where the black holes live. But that is getting ahead of the tale. "Let's start here," Sachdev says. "Condensed matter physicists study the behaviour of electrons in many materials -- semiconductors, metals, and exotic materials like superconductors." Normally, these physicists can model the behaviour of a material as if electrons were moving freely around inside it. Even if that's not what's actually happening, because of complex interactions, it makes the model easy to understand and the calculations easier to do. Electrons (and occasionally other particles) used in this kind of short-hand model are called quasi-particles. However, there are a handful of systems that cannot be described by considering electrons (or any other kind of quasi-particle) moving around. "What we try to do is understand a quantum system where you have electricity without electrons," says Sachdev. "Of course, the system does have electrons in it, but the behaviour of the system doesn't look like electrons moving at all. What you see is not even particles, but some lumps of quantum excitations that are doing strange quantum things." "Without quasi-particles, it's a mess," says William Witczak-Krempa. Witczak-Krempa, a Perimeter postdoctoral fellow, is also a condensed matter theorist who collaborated with Sachdev on the paper. "It's this quantum fuzzball of stuff." Describing such a fuzzball system is a challenge -- but it's crucial to understanding many modern materials, including superfluids and high-temperature superconductors. The broad problem of how to model systems without quasi-particles has been stumping condensed matter theorists for decades. "What we decided to do was look at a simple case of such an electricity-without-electrons system," says Witczak-Krempa. "That turns out to be a quantum phase transition between a superfluid and an insulator." A fair amount of work had been done on such systems, such that the team was able to make progress modelling the system using the traditional mathematical tools of condensed matter. Sachdev and Witczak-Krempa worked with Erik Sørensen of McMaster University on this aspect of their paper. Sørensen used a computer simulation -- specifically, a quantum Monte Carlo simulation -- to predict how conductivity should change with temperature and frequency as a superfluid turns into an insulator. "This frequency dependence tells us how the quantum fluid behaves in time. This dynamic behaviour is notoriously hard to study using standard methods, including quantum Monte Carlo simulations," says Witczak-Krempa. "Erik's work was a huge computational achievement. It took months of processing time. And, in the end, the results still needed to be converted into a form that can be compared with experiments. This is where we tried something new." To perform this conversion, Sachdev and Witczak-Krempa tackled the same system from a different angle: string theory. (Here, they build on Sachdev's previous work with Perimeter Faculty member Robert Myers and one of his graduate students, Ajay Singh.) One of the pillars of string theory is that certain quantum field theories (technically known as conformal field theories) can be translated into a theory of gravity with one extra dimension. Sachdev explains where the extra dimension comes in. Wiggling his fingers above the tabletop, he conjures strings moving through the air. "In certain configurations, the strings all end on a kind of membrane," he says, tapping his fingertips on the table's surface. "You might ask yourself: if you were living on the membrane [the table surface] -- and you didn't know about the extra dimensions where the strings were, what would you see?" He answers himself: "Only the ends of the strings. They would look like particles. What's amazing is that string theorists found that the theories that you'd use to define the ends of the strings on the membrane are remarkably like the theory we want to use to describe our system." The quantum field theory describing Sachdev and Witczak-Krempa's "fuzzball" system shares many fundamental properties with the conformal field theories associated with string theory -- so many that the researchers were able to map the two-dimensional field theory into a three-dimensional theory of gravity. "We ended up studying the physics of this alternate reality," says Witczak-Krempa. "Using this technique, we were able to translate a very hard problem into a fairly easy one." Albeit a fairly easy problem involving a black hole. "We wanted to look at the physics of the boundary -- the physics at the table top," says Witczak-Krempa. "But we wanted to heat it up a bit -- give it a finite temperature. It turns out that the natural way of doing this is to invoke a black hole." Really? "There are various ways of developing an intuition about that," he says. "For instance, you can remember that the black hole will release Hawking radiation. The Hawking radiation escapes and eventually hits the boundary where the system lives, and heats it up." 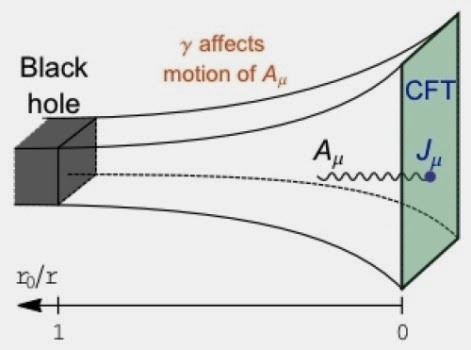 Witczak-Krempa admits it's unorthodox: "Most condensed matter people would go: 'Why is there a black hole in this paper?' It's crazy. But what's even crazier is that this mathematical machinery works quite well. It gives you answers that make a lot of sense. You can compare them directly with Erik's Monte Carlo results, and they check out." It's the first time results from a traditional large-scale condensed matter simulation have been compared to results from the new string theory approach. Sachdev is cautiously thrilled: "There are a couple of issues we don't fully understand and one discrepancy we wish we understood better, but in general it's worked extremely well. It's progress on something I've been thinking about for more than 20 years. And now we finally have a theory that is perhaps not complete, but is encouragingly successful." What's more, string theory has finally produced a set of physical predictions that experimentalists can go check. Sachdev and Witczak-Krempa are hoping that an experimental team will try soon. "Let's see what happens," says Sachdev. "We're pushing string theory to a new regime. Whatever happens, we will learn more."